Hi, I am Ruby, and I love adventure. That scar by my left eye was from a tussle with a rattlesnake! Read to the end to find out more about our first annual Roverlander of the Year contest and win some cool swag for your pup! 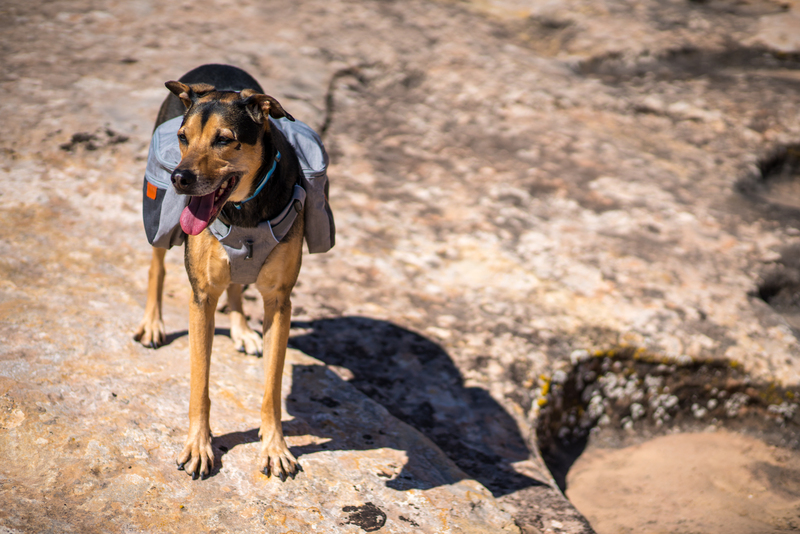 If you’re going to be an adventure dog, you’d better sport the best gear. 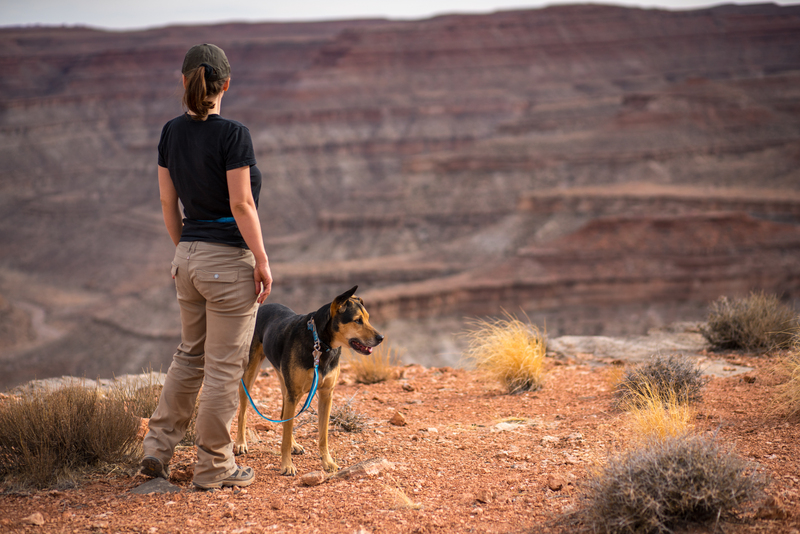 I decided to try out some of Ruffwear’s offerings on a recent trip to Comb Ridge, UT. The first part of any overland adventure is getting there, and sometimes for us pups, that can be a rocky road (no pun intended). Not only can safety be an issue on the highway, but a rough trail can really throw us around the rig. I personally have a high center of gravity and have ended up in the footwell more times than I care to remember. 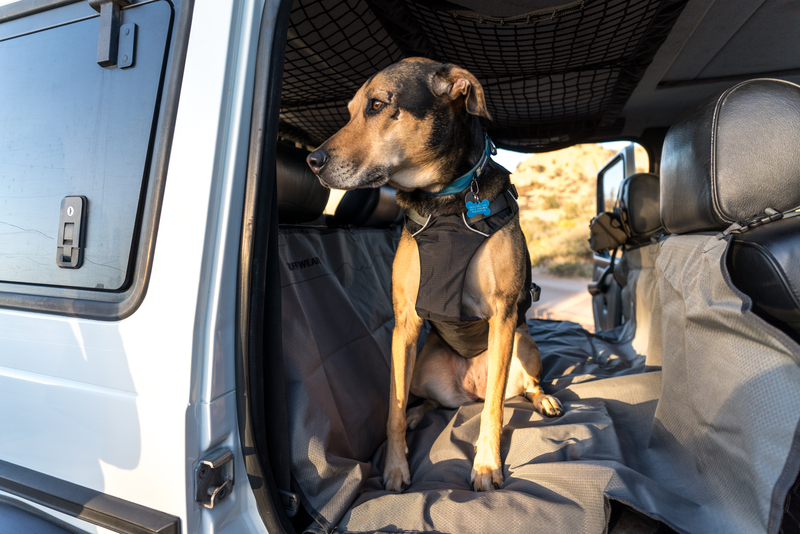 That’s why Ruffwear came up with the Load Up Harness ($80 USD), a vehicle safety system that keeps us belted in and on the seat where we’re supposed to be. The harness is designed with an attachment loop that all standard seat belts can fit through, so no matter what your person is driving, you can be sure to stay safe. Have your human check out the videos of the crash testing the company did in 2014 (see video here). It’s a little scary, but don’t worry, those aren’t real hounds, just canine crash test mannequins. These tests helped them decide to reinforce the stitching. They also changed the webbing adjuster to make sure it stays put, although I still noticed a small amount of twist in mine if I turn around once too often in the seat. You can help that by making sure your humans take the time to properly fit yours. 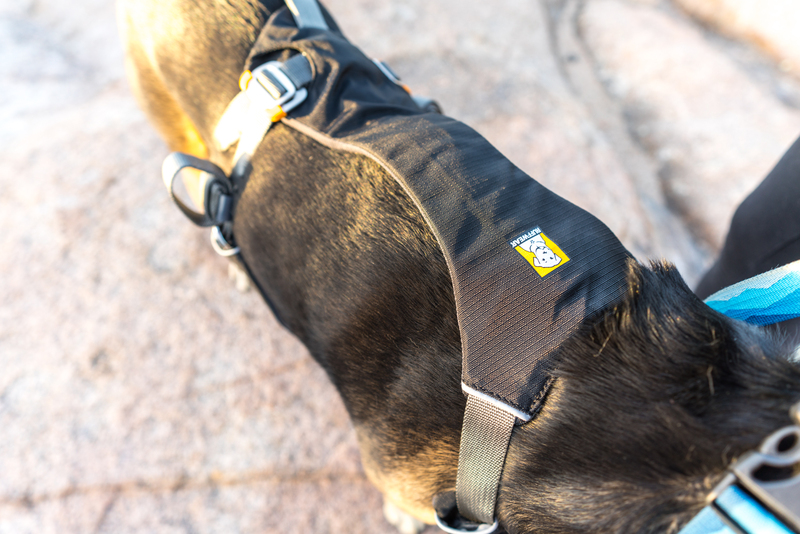 It’s got a lot of extra padding, which is a must for sensitive canine armpits and sternums, and it helps me feel secure even on the most washed-out back roads. My mom and dad like it because they can keep it on me when we take potty breaks. I especially appreciate that it still gives me some room to maneuver while it keeps me steady—I had no problem lying down or making it to either window to feel the breeze ruffle my ears. 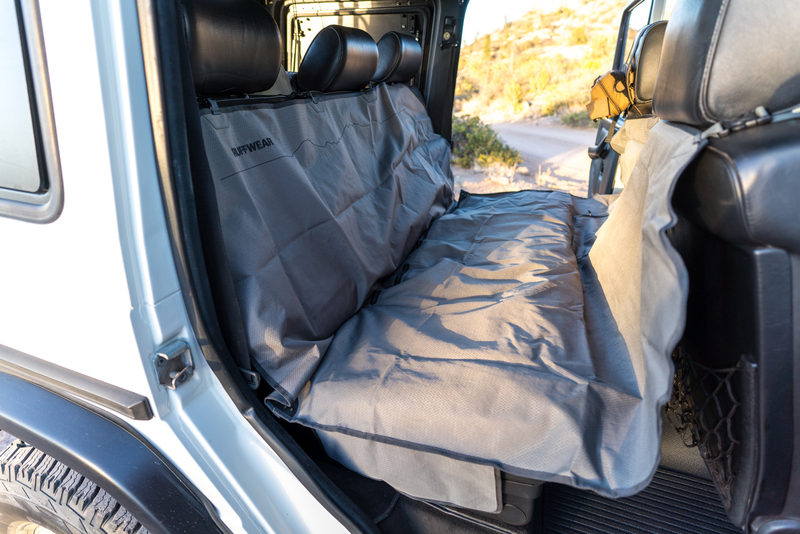 They also make a Dirtbag Seat Cover ($80 USD), designed to protect the backseat in style. 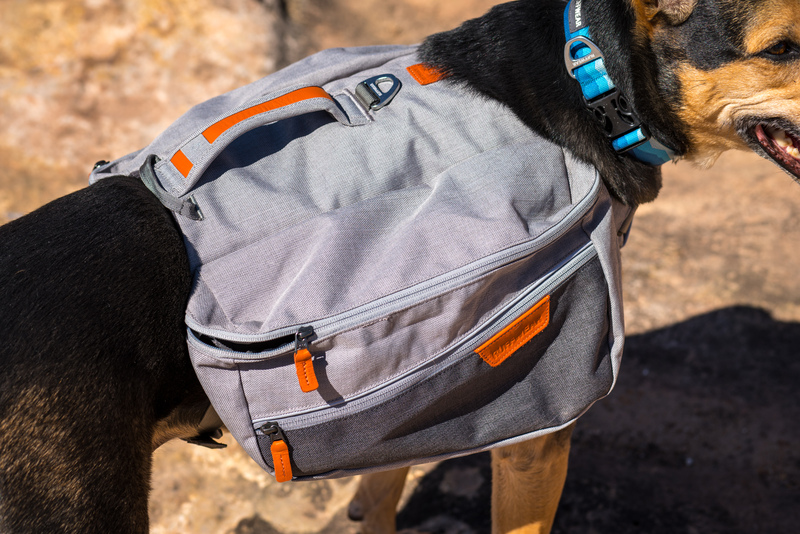 It keeps all the dirt and mud you gather while roaming from getting on the upholstery, in case your humans worry about stuff like that. I personally try to collect as much grime as possible, a souvenir that often goes underappreciated. 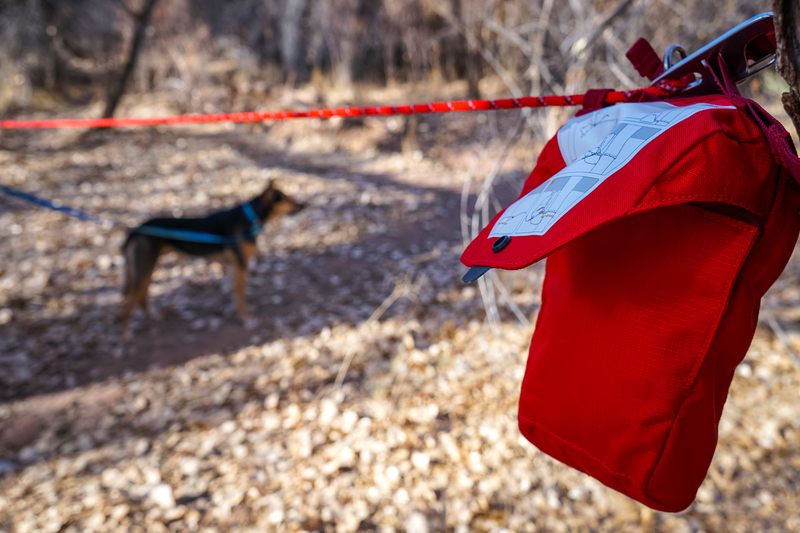 My people found that it was easy to install, and the double stitching is durable even when loading up at full doggie jump speed. It’s waterproof, in case you are any type of Labrador, and mom and dad can throw it in the washing machine. 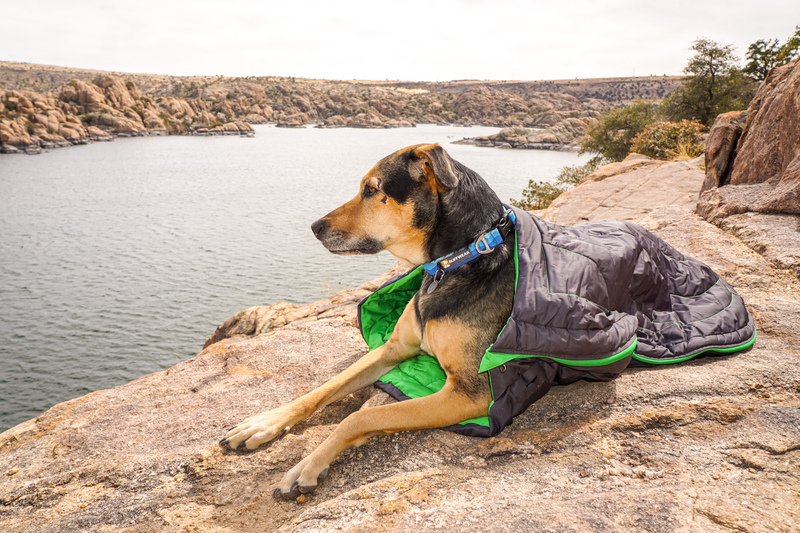 My favorite part, though, is that it can also be configured hammock-style, which means that after a hard day of chasing sticks, squirrels, or rabbits, you can take a load off and just enjoy the ride. We drove for a long time, which was ok because I got biscuits. When we got to Comb Ridge (finally! ), my humans made sure I hydrated by drinking from a Quencher ($15 USD). This foldable, lightweight bowl was my water solution for the duration. It easily packed up in my backpack, so I was sure to take as many water breaks as I needed while we climbed into the wash and up the boulders to visit some of the ruins. 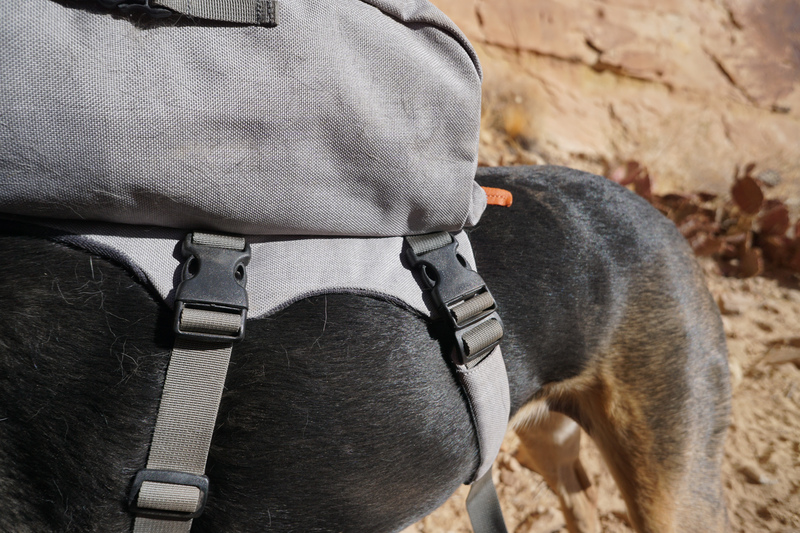 For my food, we trekked with the Quencher Cinch Top ($20 USD), which closes tightly making it easy to carry my kibble wherever we needed to go. 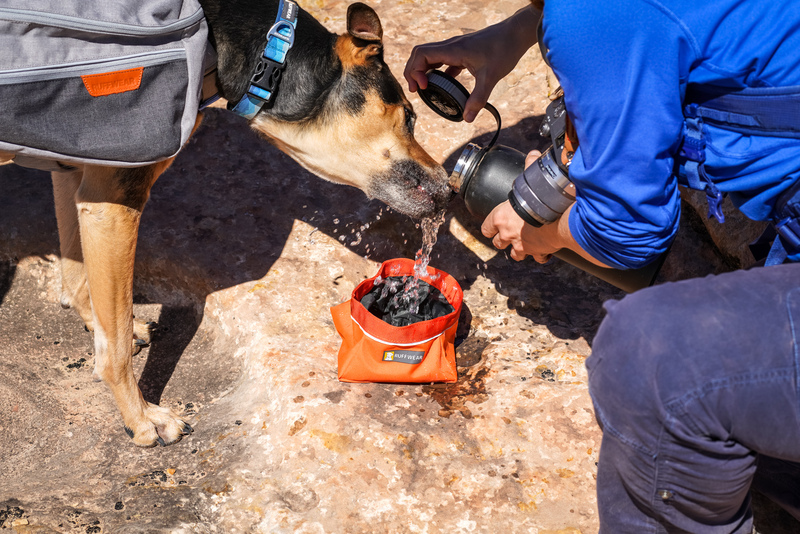 Cleaning any remaining wet food out of the bowl while on the trail was tricky, so for those of you mutts on a special diet that requires canned food, this may not be the best setup for you. And speaking of backpacks, my Commuter Pack ($100 USD) gave me the ability to carry my own load, easily fitting food, water, and bowls for all day hiking, facilitating us trekking back to some of the more remote sites. That was especially nice for my folks, because Comb Ridge is chock-full of some pretty amazing ruins. I got to carry my own water and food for the trip! While we’re talking about ruins, there’s something I want to bring up that us canines don’t usually think about. Ruins are what my humans call “culturally sensitive sites,” which basically means that these places matter a lot and what’s there can’t be replaced. At Comb Ridge, many of the sites are over 1,000 years old (that’s like a bazillion in dog years), so my people made sure I was leashed up. That way, I didn’t have to worry about knocking down a wall or breaking pottery. 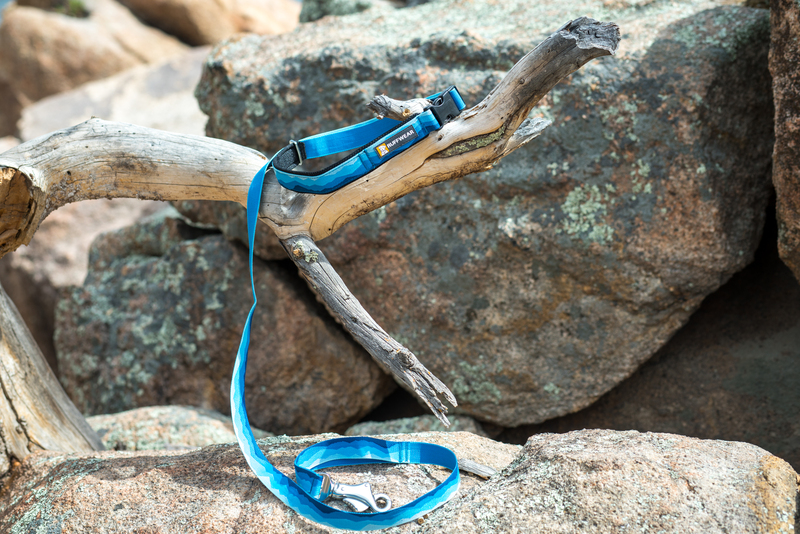 We used the Flat Out Leash ($30 USD), which is easily converted to a waist leash. 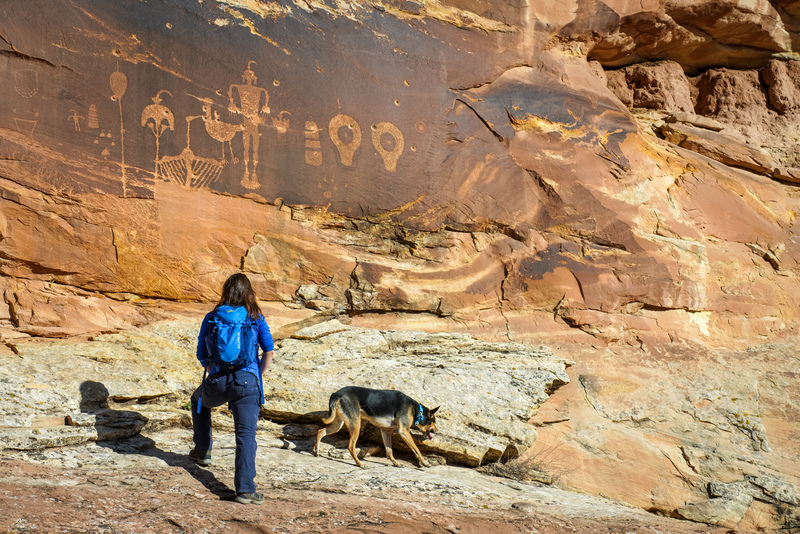 It’s so lightweight, I hardly noticed it, and the hands-free option allowed my folks to take photos of all the cool petroglyphs and cave paintings. The leash was a sweet blue wavy pattern, which set off nicely against my shiny black coat. It also matched the Hoopie Collar ($20 USD) I donned. They both come in a ton of designs, so whether you’re a brindle mastiff or a white husky, you’ll find something stunning. The side release buckle was ever so simple for my humans to get on and off. No more unintentional yanking of my neck while they wrestle with my collar. 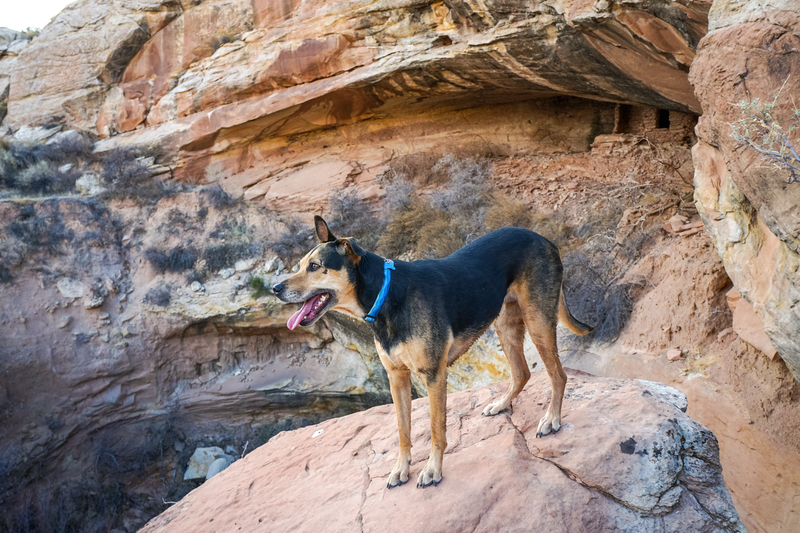 Not only did it make it easier for my humans to leash me when we got into any Anasazi complexes, it’s also where I display my id tags, a must for a dog out on an adventure far from home. 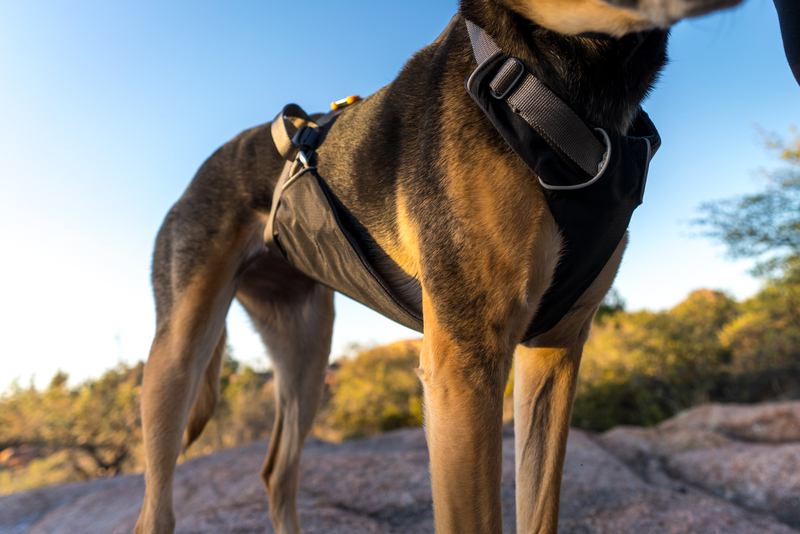 Ruffwear puts this cool little silencer on, so you don’t have to jingle all the time. There’s also a spot for an LED safety light, allowing our humans to keep track of us once the light fades, since they have terrible night vision and a lousy sense of smell (we love them anyway). Once we got close to the ruins, my people always made sure I was leashed up. We set up camp each night near the start of the trails. When I’m in a new spot, I like to sniff around and see who’s been by. My folks are pretty cool about it because I don’t wander far, but when it gets dark, that’s another story. They hooked me up near the trailer with the Knot-a-Hitch ($60 USD) system, which let me roam without fear that I’d disappear into the night chasing a scent. 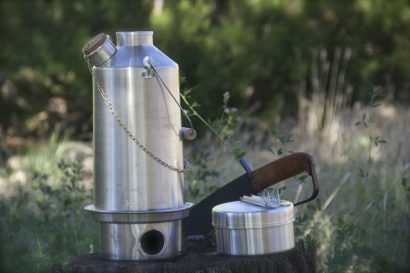 It keeps me out of trouble while they pitch tents, set up trailers, and (my favorite) cook food. 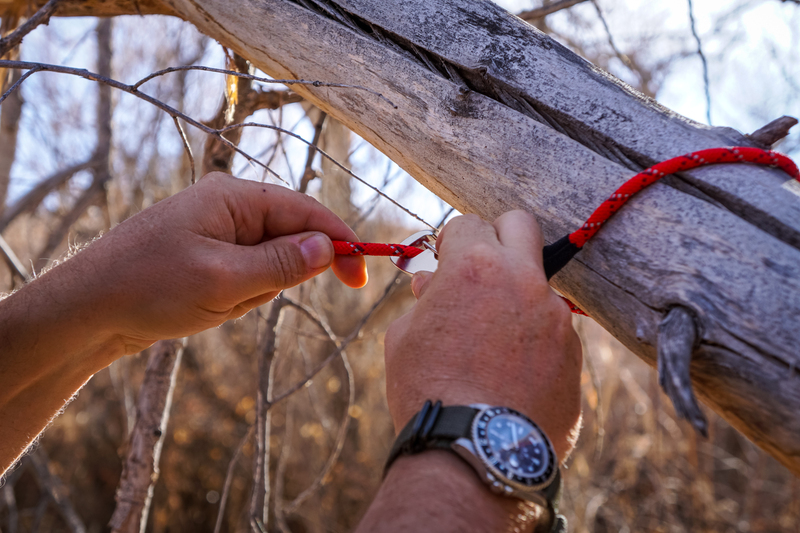 It can be tensioned between trees or attached to a single post, and it’s reflective, so the people can avoid any awkward clotheslining moments. 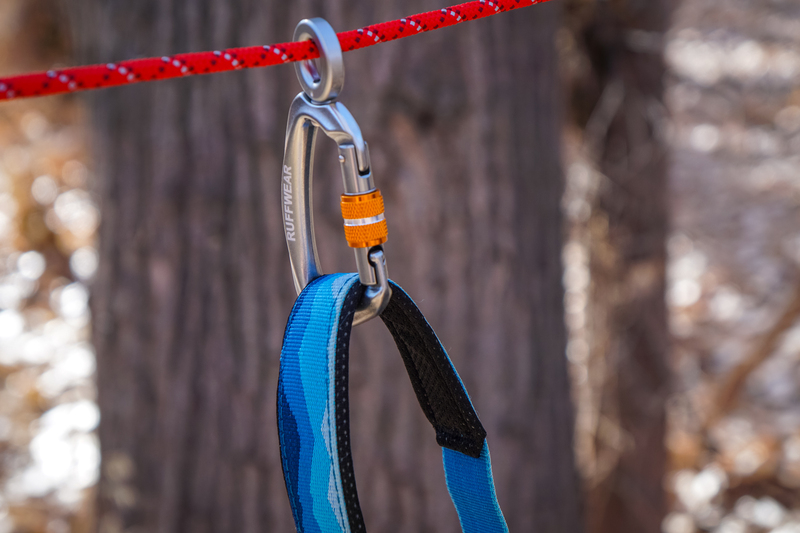 The tensioning system was inspired by rock climbers, and I stayed tangle-free due to the swiveling carabiner. The best part was our overnight backpacking adventure to Monarch Cave Ruins. We pitched a tent nearby and watched the full moon rise in the valley and light up the ancient walls. Red and orange handprints lined the enclave, and petrified corn cobs littered the sand near intact metates. It was still a bit chilly at night, but I didn’t need to worry. I had my very own sleeping bag! The Highlands Sleeping Bag ($100 USD) kept me snuggled and warm, and a Highlands Pad ($30 USD) can be added to the integrated sleeve if you happen to be winter camping. Raise your paw if you’ve been waiting for one of these! 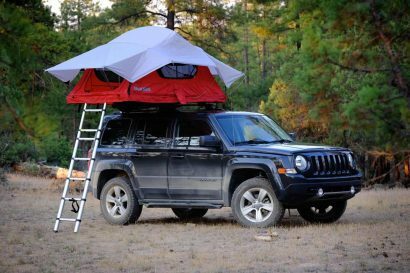 It also doubles as a nice camp bed to hang out on by the fire with your people. 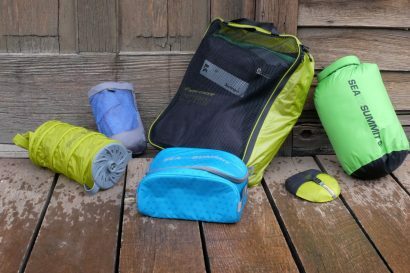 It comes in its own case, and has been designed to fit into Ruffwear’s multi-day backpack, the Palisades Pack ($150 USD) for those of you who are into serious backcountry travel. I got home from our five-day Comb Ridge adventure feeling exhausted but satisfied. 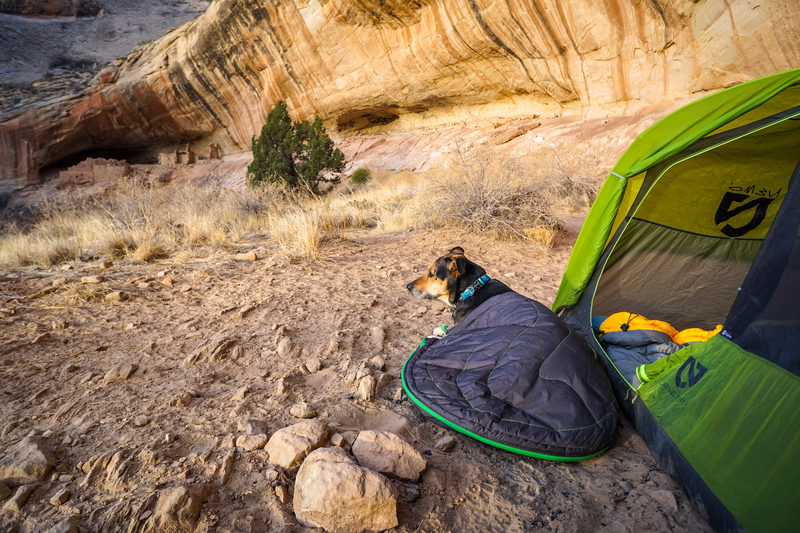 From doorstep to trailhead to campsite, Ruffwear’s gear kept my tail wagging. Is your pooch your road trip copilot? 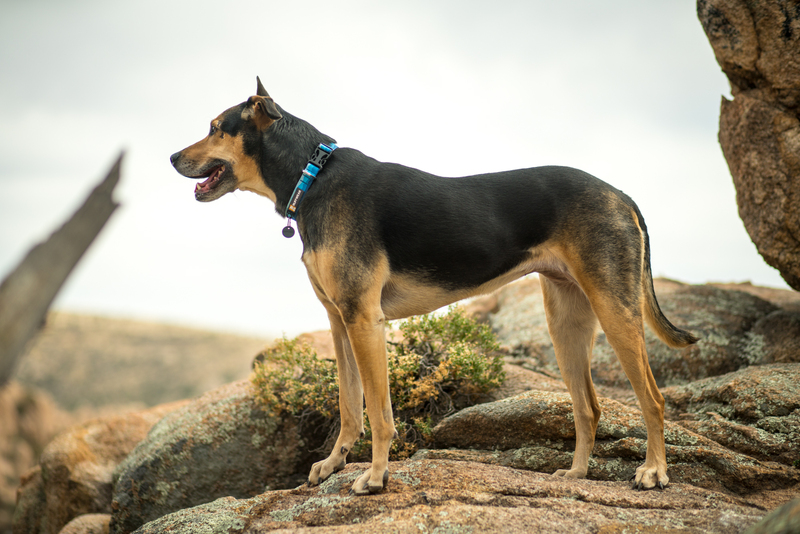 Has your hound overlanded the Amazon, hiked the Himalayas, rafted down the Colorado? We want to hear about it! Join Overland Journal on Facebook for our first annual Roverlander of the Year Contest. 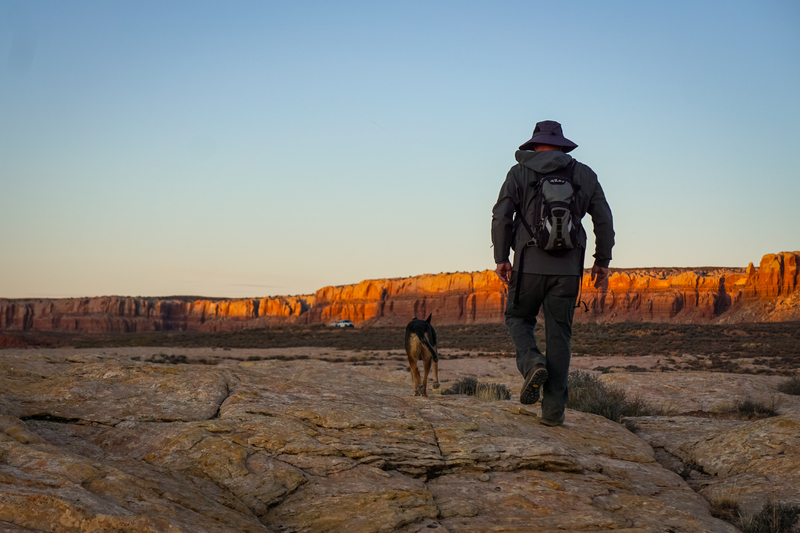 Share your favorite canine story with one picture, and you could win some Ruffwear gear for your adventure dog. The winners will be decided based upon the number of post likes, so get your friends and family involved. Click here to submit your pup’s story. Contest ends midnight on Friday, June 8.